Essential shops & services with everything you need all wonderfully local! 07834 983 155 www.chrislewiselectrical.co.uk Faringdon based electrician Call us today to see how we can help you? Set during the sweltering summer of 1976 the story encompasses love, lust, domestic violence and crime noir, the story follows Meriel – a radio agony aunt trapped in an abusive relationship with her hideous husband Cameron. Into the fray comes a radio presenter Seb who offers an alternative life to Meriel, a way in which things should be. Before the romance is allowed to take its natural course something dreadful happens that throws things into disarray. I’ve had a look at the reviews online on this one, and it is true that it’s not universally loved. I will agree that the characters are fairly one-dimensional, and certain plot points are a bit weak. But it’s pacey, and it’s diverting. And it’s atmospheric Madeley captures the restlessness of an eternal summer and evokes the Lake District in all its glory. Maybe we’ve all become too over-reliant on the ‘voice of the people’. Once upon a time we bought books because we liked the look of them and that was that. Now we seem to throw it out to the ‘court of public information’ before we take a chance. If I’d listened to the vox populi I would never have picked up this book. And then I would have missed the chance to experience a roller coaster of a read. Don’t take my word for it, judge for yourself. Artist of the Month Val Hughes We are again pleased to welcome Val Hughes as our Artist of the Month in April. Val enjoys both the practice and teaching of art. Prior to her retirement from life as a Primary school teacher/arts co-ordinator, Val successfully ran several local ‘Arts in the Community’ projects. She is an exhibiting member of Faringdon Arts Society and will also be exhibiting at Artweeks in Great Coxwell during May. Working predominantly as a digital artist and maker of wire sculptures, she produces a diverse range of subject matter but is always happy to take commissions for dog and cat portraits. Val is also a published author of poetry and children’s story books some of which will be on sale alongside her art work or they can be purchased directly through Amazon. She also co-ordinates Faringdon Writers Group - a group of local writers and writing enthusiasts. If you wish to contact her please email valerie.hughes58@gmail.com or see her website at www.valhughes.co.uk. She also has a Facebook page - Val Hughes Words & Art. Come along to see Val’s work in the Information Centre in the Pump House, Mon - Fri 9am - 4pm and Sat 9:30am - 1pm. POP-UP FAMILY STUDIO! Free photo-shoots View and order online What is it about your Family NOW that you would like to capture? The Place, Family and Children's Project, Faringdon is a community funded project with the aim to support all families with children from birth to 5 years old. For information on all groups, events and courses we are running please find us on Facebook; https://www.facebook.com/theplacefaringdon/ or our Website;www.theplacefaringdon.org or contact Carole on 07973 678837. Faringdon in Bloom 2019 Faringdon in Bloom 2019 is set to be a fun and exciting competition and free to enter. Categories will include best large garden, best small garden, best allotment, best business floral display, best business hanging basket, best wildlife garden, best patio garden, best new garden, Joy to the community and best junior miniature garden. Judging will take place on the of 21st, 22nd and 23rd of June 2019. If you would like to take part simply download an application form from Faringdon Town Council website or collect a form from the Information Centre in the Pump House. Winners will receive engraved trophies, and certificates will be given for Highly Commended achievements in each category. We look forward to seeing all this yearâ&#x20AC;&#x2122;s entries. Asking a trainer for help can give you the confidence to know someone is there when times get difficult. We work with you to improve your fitness, relieve the pain of injury with massage and guide you through how the food in your fridge affects your energy levels. Maybe a big event is coming up in your life and you are not sure how to make the appropriate change for the best? Whether you are recovering from a knee operation, fighting the onset of ageing, racing in an historic car race, training for a charity bike ride, taking part in world championship fencing competitions, running the London marathon, riding in an important dressage event - or just trying to stay feeling great - you can always benefit from professional advice. Discussing your requirements with a local professional can help you make the difference you are looking for. I say this not only for myself but for all the wonderful people out there who are always ready to help you achieve your goals. Don’t be scared to ask for advice – it might just be what makes the difference between failing to get the results you want and achieving success. There is still, very much life in the property market, but to (badly) coin a phrase, not as we used to know it. Our region, like much of the UK, is continuing to see a lower level of property transactions taking place when compared to the most recent peak of activity back in 2014 but this rise and fall in activity levels is nothing new and reflects the ebb and flow of the national economy and the prevailing politics at the time - although clearly our current political situation is a little more unusual! In such circumstances, it is remarkable how robust our local property market is with sales still very much taking place across a wide range of properties, underlining the continuing appeal of our market town and the surrounding villages. If anything, the bigger challenge to the Faringdon market is the high level of new homes and in particular the availability of Help to Buy. The “Law of Unintended Consequences” from this national policy has resulted in a significant negative impact being felt by those selling nearly new estate houses which in all other regards are directly competing with the shiny new Bovis, Bellway and Crest homes in the town – with Bloors and others to follow. Traditionally, buyers had the choice of: Brand new but more expensive, or: Not so new but better value. With Help to Buy, buyers now have a choice of: Buy new and have 20% of the price paid by the government or: Buy nearly new and have to pay for it all. That cannot be right. Our advice to those looking to sell in such circumstances is to ensure that their property is presented in the very best way, to emphasise the more established setting (garden, trees, neighbours) and yes, to be as competitive as they can be on price. But the great thing about our market is there is such a wide range of appealing properties and places to live that there is always something happening across the region. Our Saturdays remain the busiest viewing days and we are regularly packed full with appointments. From barn conversions and period farmhouses to new executive village homes and town centre mews developments, we are involved in them all and most of these within 5 miles of our office. So yes, there is plenty of life in the property market, it’s just different to how it has been in recent years. EXCLUSIVE TO SECOND 2 NONE FREE CAR TYRE WARRANTY Lifetime accidental damage warranty on all Marshal and Jinyu tyres purchased For more information speak to Bob. Should the Military be involved in Education? Are you Property Rich and Cash Poor? Equity release could be the answer, if you are 55 or over and own your own home! FREE Advice with no obligation from an established company based in Carterton. 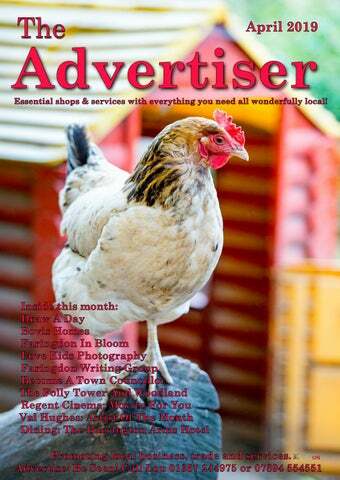 The Advertiser is produced by Lou Guthrie published by The Advertiser Magazine Ltd Tel: 07894 554551. All artwork designed by us is the copyright of The Advertiser Magazine Ltd and must not be used by or in any other publication, in whatsoever format, without our prior written consent. No part of this publication, whether advert, pictures or text, may be reproduced in any format whatsoever without the prior written consent of The Advertiser Magazine Ltd . The information published in the advertisements and other articles is supplied and approved by advertisers. The Advertiser Magazine Ltd does not verify or ratify any claims made in such advertisements or text, nor does it accept any claims or liability arising from contact with or use of services advertised. Every effort is made to ensure the accurate reproduction of information supplied by advertisers in their advertisements or other text submitted. Any inaccuracies must be notified to the publisher immediately following the first insertion so that amendments may be made for subsequent issues. The Publisher does not accept responsibility or liability for claims arising for inaccuracies published in advertisements where the advertiser has not advised The Advertiser Magazine Ltd prior to publication.